Pick up from Ayers Rock (Uluru) Airport - we can pick up from any flight between 11.30am - 13.40pm (Sydney Jetstar, Melbourne Jetstar, Sydney Virgin and Qantas Cairns flight) Those arriving into Ayers Rock Airport (Uluru) on the Cairns flight in the morning can catch the free shuttle bus to Ayers Rock Resort (Outback Pioneer) for pick up at 12.00pm. Day 1: Uluru Sunset (Meals - L,D) You will be picked up from either Ayers Rock (Uluru) Airport or the Ayers Rock Resort in Yulara from 12:00pm. First destination is Uluru. 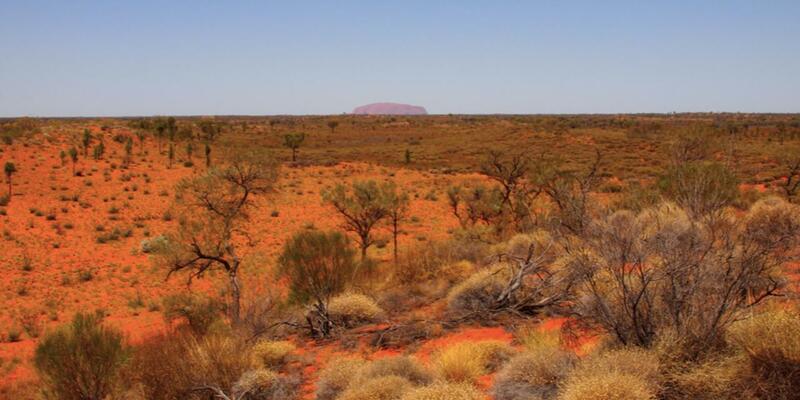 Take in the breath taking sight of Uluru the World’s Largest Rock. You then have time to complete an Uluru Base Walk around Uluru. You will see beautiful sites such as the Mala Walk, Mutijulu Waterhole and Aboriginal Cave Paintings.We spend this night at the Ayers Rock Campground with toilets and showers after having dinner watching the sunset over Uluru. Day 2: Kata Tjuta & Uluru Sunrise (Meals - B, L, D) Feel the spiritual significance on a guided walk through to the Valley of the Winds at Kata Tjuta. Be shown bush tucker along the hike before heading to the Aboriginal Cultural Centre where you can listen to tales from the ‘Tjukurpa’ Dreamtime. We spend this night at the historic Kings Creek Station with toilets and showers, 20km from Kings Canyon. Day 3: Kings Canyon (Meals - B,L) Kings Canyon. Enjoy a 3 hour guided hike through the sandstone domes of the Lost City. Visit the many Amphitheatres, North & South Walls and the beautiful Garden of Eden. We stop on the way home for an optional Camel Ride at the Camel Farm and head back to Alice Springs and civilization. Enjoy 1 night at the YHA Alice Springs in a 6 share dorm room (included in the package) Get cleaned up and we meet later with your Guide for dinner and a couple of beers at The Rock Bar. Terms: If you are flying into Ayers Rock (Uluru) Airport on Day 1, please phone The Rock Tour 1800 246 345 on the day before your tour to re-confirm your pick up location and time which will either be 1/ Ayers Rock (Uluru) Airport after 12:30pm or 2/ Ayers Rock Resort after 12:00pm.